A breakdown of art, culture and entertainment in Central Arkansas. Each week, Stephanie Smittle and Omaya Jones discuss inventive film, music, theater and art happening in the Greater Little Rock area, and invite guests to sit in on the conversation. This week, we talk Quinto Poder, 607 and Levelle Davison's new holiday album, as well as Howard Hawks' 1940 film "His Girl Friday," the next up in the Arkansas Times Film Series. This week, we make some recommendations and talk with Charlie Hunter, a brilliant jazz/blues guitarist who lands at CALS Ron Robinson tonight as part of the Arkansas Sounds series. This week, Omaya is joined by visual artist and Zine Night organizer Matthew Castellano, and they talk "The Chilling Adventures of Sabrina," Club Sway's "Rocky Horror" and more. No Small Talk, Ep. 30: "Tampopo." This week, we talk arts news and peer into the brothy underbelly of Juzo Itami's ramen western "Tampopo," the next film in our Arkansas Times Film Series. This week, we talk with Arkansas Symphony Orchestra Music Director/Conductor Philip Mann, longtime ASO Principal Keyboardist Carl Anthony and Steinway technician/gallery owner Stephen Wirges about a paragon of a piano that's been gifted to the Orchestra, just in time for the ASO's season opening this weekend. No Small Talk, Ep. 28: Arkansas Times Film Series: "All That Jazz"
This week, we dive into the hat-tipping, jazz hands-waving life of renowned dancer/director/choreographer Bob Fosse, and the dark sense of burlesque and vaudeville in Fosse's semi-autobiographical 1979 fantasy, "All That Jazz." This week, your newly crowned Miss Gay Arkansas stopped in to chat about drag artistry, equestrian side gigs, the ramp-up to the Miss Gay America pageant and Dollar Store makeup looks. No Small Talk, Ep 26: Dillon Hupp of ACANSA, "The Red Shoes." This week, we talk about “The Red Shoes,” the 1948 film that inspired Scorsese and Spielberg, and the next film up in the Arkansas Times Film Series. Also, Dillon Hupp, Executive Director of the ACANSA Arts Festival, stops by to talk about this year's lineup. This week, we talk with William Moon about Kaleidoscope, a nine-day LGBT film festival featuring compelling screenings, a Queer Arts Street Fair, a "Little Mermaid" singalong, a fashion exhibit and more. This week, we talk with Matt DeCample of Arkansas Cinema Society about Filmland, an ACS event that's bringing Richard Linklater, Mary Steenburgen, Kristen Schaal, David & Christina Arquette and many others to town for screenings and conversation with filmmaker/Board Chair Jeff Nichols. This week on "No Small Talk," we catch up on some arts and culture news and implore you to get outside this weekend. This week, Omaya and Stephanie talk with composer Yuni Wa about his prolific body of work, his new album "Dawn of the Black Wings" and problems with the gentrification of electronic music. This week, we sit down with National Book Award-winning comic book artist Nate Powell and talk about his work on the "March" trilogy, 90s-era Little Rock punk and Powell's forthcoming graphic novel, "Come Again." No Small Talk, Ep. 20: Mutants of the Monster, "Unforgiven." This week, Omaya and Stephanie chat with Christopher Terry (C.T.) of Rwake about the upcoming heavy music micro-festival, and take a look at the next film in the Arkansas Times Film Series, "Unforgiven." This week, Omaya and Stephanie talk with Jennifer Gerber, Executive Director of the Hot Springs Documentary Film Festival and Sonny Kay, Executive Director for Low Key Arts, about filmmaking and Low Key's summer workshop intensive, "Inception to Projection." Omaya and Stephanie catch you up on a bit of entertainment news and talk with Director of Trust Tree Programs Correne Spero about the organization's summer songwriting camps for girls. This week, Omaya Jones and Stephanie Smittle hear from Michelle Gann of Mortalus about heavy music, classic influences, Friday night's show with Houston's Doomstress and what it's like to be a trans woman making metal in Arkansas. This week, Omaya and Stephanie talk with Bryan and Meredith Martin-Moats, the parents behind Bash-O-Bash cast of animated characters and behind McElroy House, a rural community organization for cultural resources in Dardanelle. No Small, Ep. 15: Rah Howard, Trust Tree, Spa-Con, "White Material"
This week, we talk with videographer/musician Rah Howard about his new album, "Let There Be Light," round up some entertainment news in the area and look forward to the next film in the Arkansas Times Film Series, Claire Denis' "White Material." No Small Talk, Ep. 14: Jasmine Blunt of "The Influence"
This week, we talk with Jasmine Blunt about her work on The Influence, touch base on a few pieces of news and festival lineups in the area and make some recommendations for the next couple of weekends in the Central Arkansas area. This week, we talk about Werner Herzog's opus "Fitzcarraldo" -- the next film up in the Arkansas Times Film Series; Little Rock native composer Florence Price's legacy; and check in on new music from Silver Anchors, Pallbearer and The Uh Huhs. This week, we check in on new music from Or, Ghost Bones, Spirit Cuntz, Colour Design and Couch Jackets, look over the panel lineup for the Bentonville Film Festival and talk with Osyrus Bolly and Bill Kopsky about their work at the Arkansas Public Policy Panel. This week, Omaya Jones and Stephanie Smittle break down the movies "Veronica," "Les Affamés," alternate depictions of the O.J. Simpson Trial, the art of Joshua Brinlee and The Move for the week: a concert from the Juilliard-certified digital pipe organ rockstar Cameron Carpenter. This week, we round up a few jazz shows happening in the Central Arkansas area, and recap a big weekend for music in Hot Springs. This week, we wrap up the Arkansas Times Film Series' run of heist movies and talk with Drew DeFrance about his eponymous band, the touring life and opening for Bon Jovi. This week, we talk with Katy Henriksen from KUAF's "Of Note" and break down what's happening with arts in Arkansas this Spring. We chat this week with Sarah Woolf (of "Follow the Woolf"), the Musicians Showcase, and the new Bonnie Montgomery album. 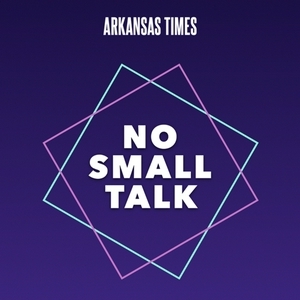 This week's No Small Talk features even more coverage of the ongoing Arkansas Times Musicians Showcase plus a preview of "Point Break," the next movie in our film series at Riverdale. Episode 5 of No Small Talk is continuing our coverage of the Musicians Showcase. This week we talk with judges Dazz and Brie. Week 4 of "No Small Talk" takes on: the Musician's Showcase and the Oscars. Hosts: Jacob, Stephanie, and Omaya. DeAngelo Lee talks about incarceration in Arkansas. Week 2 of "No Small Talk" takes on: CAMA and The Post. Jacob, Stephanie, and Omaya welcome in Ark Times staff writer David Koon to talk about the latest Spielberg film and a love of Linotype. As always, we've got recommendations for great stuff to do in Central Arkansas this weekend. On this week's inaugural episode of "No Small Talk" we discuss tonight's Arkansas Times movie: Rififi. Jacob, Stephanie and Omaya also come in with some recommendations and things to look forward to doing this week.